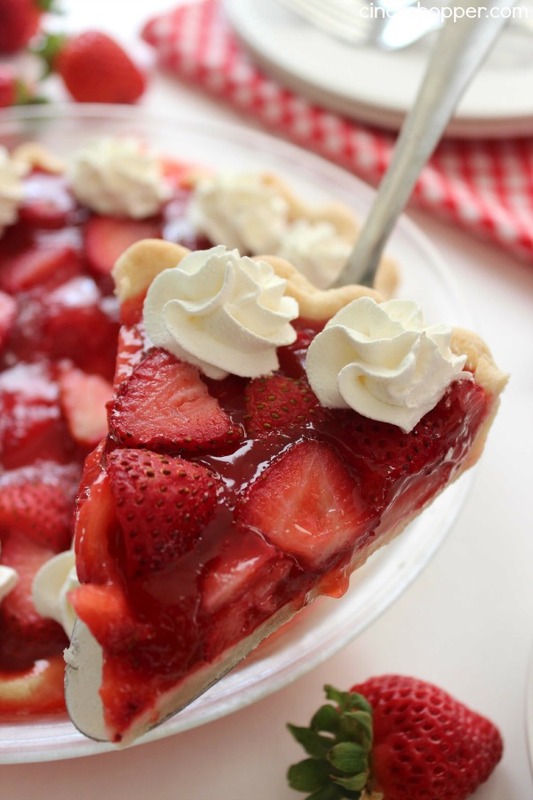 This super simple Strawberry Pie Recipe is loaded with strawberries and a homemade jelly filling. You will find it to be like the same you find at Frisch’s or Shoney’s. Oh so YUMMY! 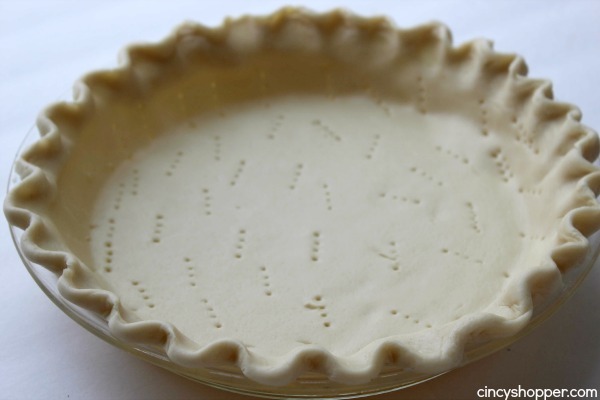 Since this pie starts with a store bought crust, you can whip it up in no time at all. When I was a child, we lived in Tennessee briefly and we would frequent Shoney’s restaurant for dinner. I recall basically inhaling my dinner so I could enjoy a slice of pie for dessert. The stuff was just amazing. After moving here to Cincy, I noticed that Frisch’s Big Boy also had this same pie during the summer months. During the summer, I will quite often take the kiddos for dinner at Frisch’s just to enjoy a slice of pie for dessert. 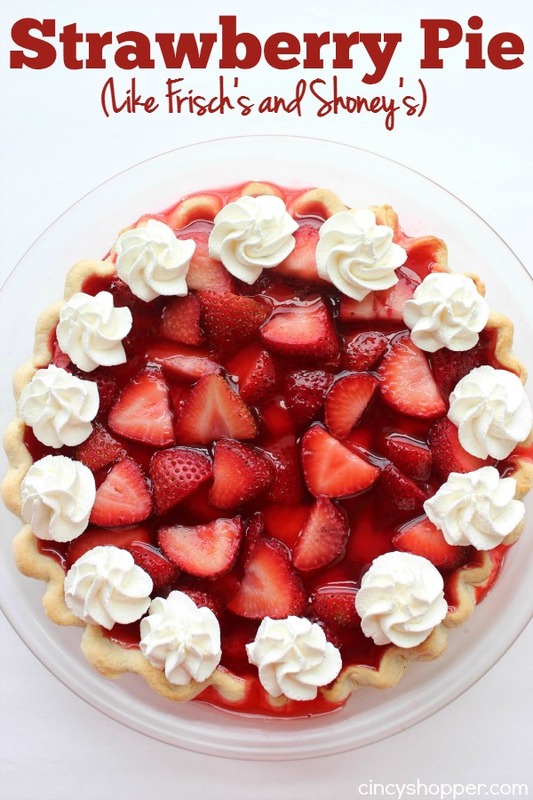 If you have never had Shoney’s or Frisch’s Strawberry Pie, you are really missing out. 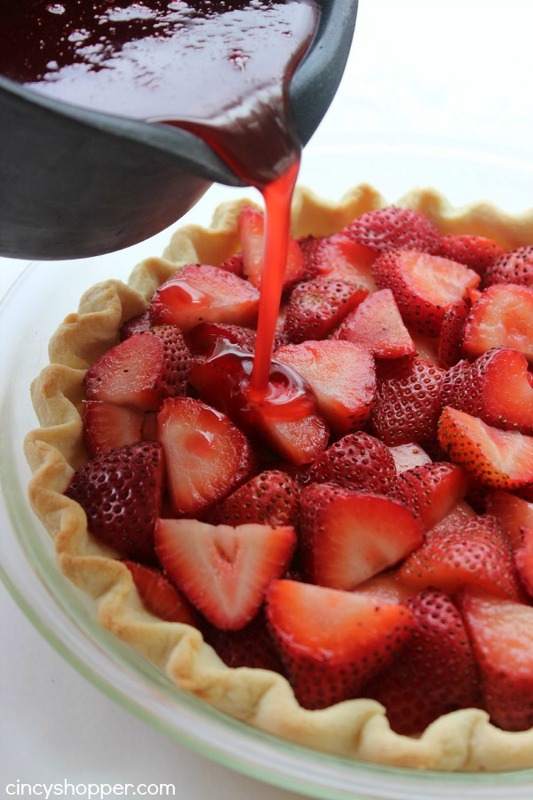 The pie crust is basic and topped with fresh strawberries and then a fabulous strawberry gel that makes for a perfect summer time dessert. Plus you will want not want to forget the whipped cream. Totally delish! 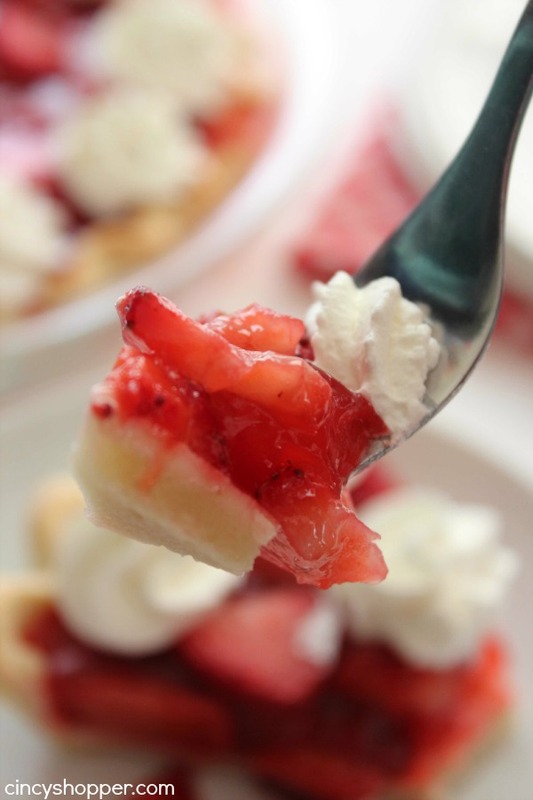 Last week, I took the kiddos for dinner and all of them ordered a piece of the yummy strawberry pie topped with whipped cream. My boys were inhaling it like it was the last dessert they were ever going to enjoy, ha ha. Then they were asking for seconds. I quickly responded with “No way, these slices of pie are not cheap”. As I was devouring my slice of pie, I got to thinking about making our own right at home. I knew it couldn’t be to difficult. I was correct! It was not difficult at all. 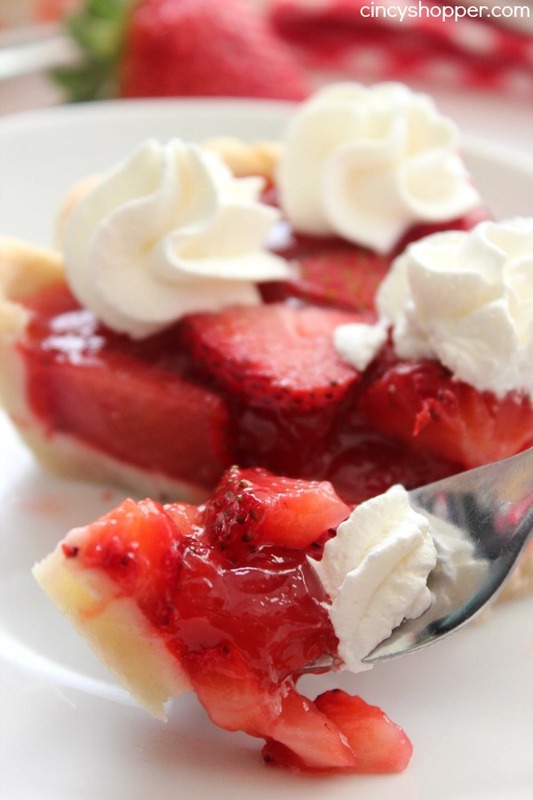 I used a store bought pie crust to save time and strawberries were on sale for just $0.99 at Aldi this week. Making our own pie at home did not cost much at all. Summer time desserts filled with berries are always best. I make up batches of Homemade Strawberry Sauce to top our ice cream, angel food cakes, and waffles for breakfasts. Just a few ingredients are needed to make this super simple pie. 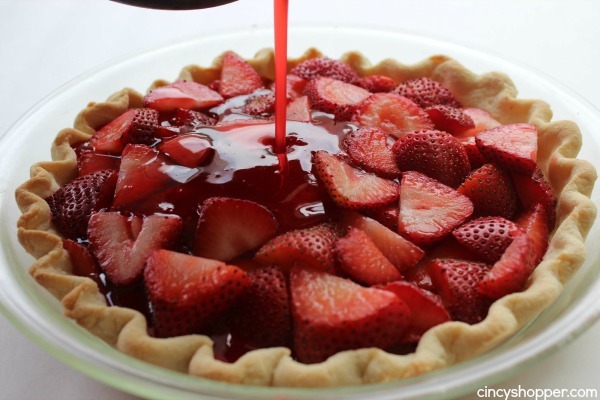 You will need a store bought pie crust or you could use my Easy 4 Ingredient Homemade Pie Crust, strawberries, strawberry Jell-O, sugar and some cornstarch. You can have it whipped up and in the fridge in no time at all. If you have a summer picnic or bbq that you are needing an easy but totally tasty dessert, this pie is perfect. 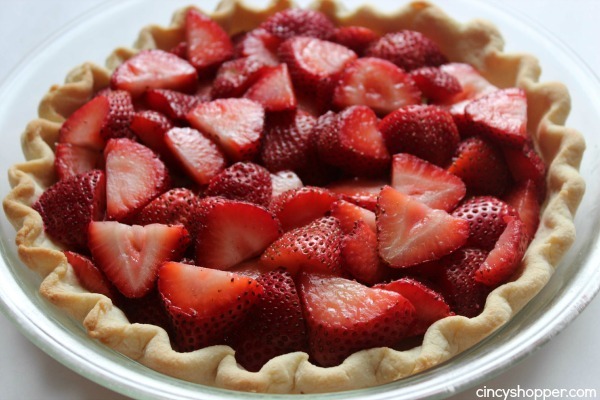 Do you have a favorite summer time pie? This pie is a new favorite in our house. 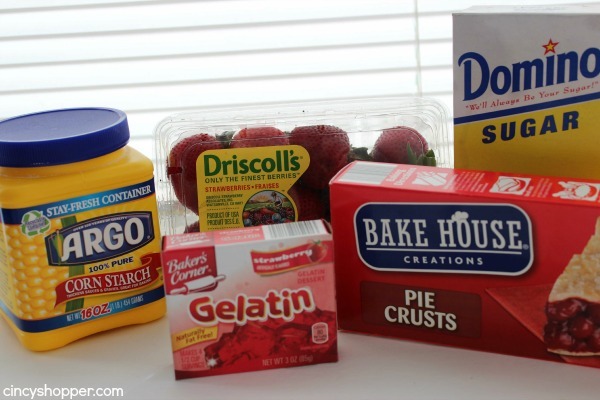 Making the strawberry pie, what size box of jello do you use? 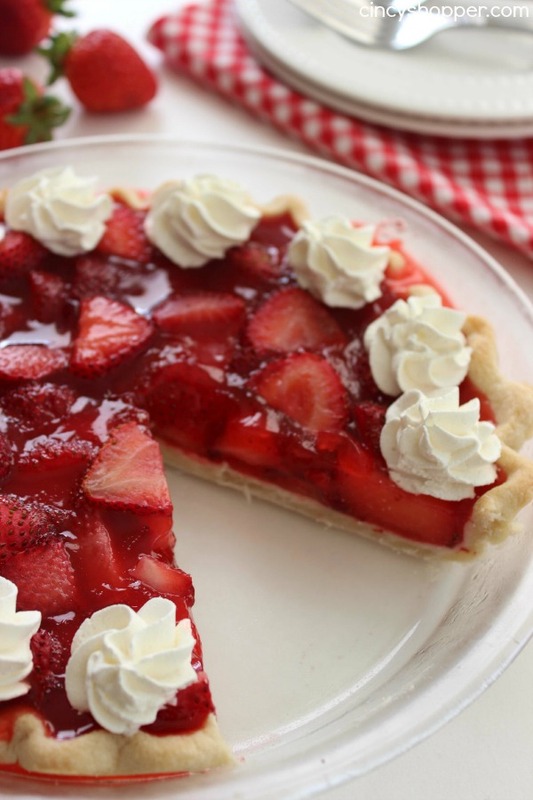 We love strawberries and this pie would be a great dessert! 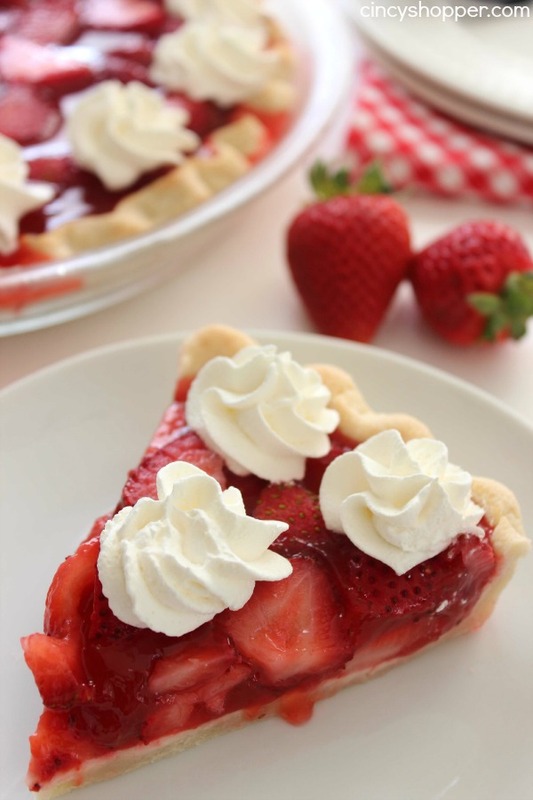 Strawberry pie is one of my summer time favorites! Yours is so beautiful and yummy looking! Ooo…this turned out amazing! I LOVE strawberries! Thanks so much for taking the time to link up with us over at the #HomeMattersParty – we hope to see you again on Friday! I used to live in Cincinnati. Now in Phoenix, AZ. Loved Frisch’s, didn’t know they were still around. Wish we had one here. I am thinking of making this pie on the weekend would I be able to make it in the afternoon and leave it in the fridge till Sunday evending? Does this pie freeze well? Hi Deonne! I have never tried to freeze this pie. If you decide to give it a try… be sure to let us know if it works for you. I don’t have a website, but I make a similar pie. I use big box of sugar free Strawberry Jello, the small box of sugar free cook vanilla jello pudding, sliced strawberries, a cup and 1/2 of water. Heat water, jello, pudding til thickens. 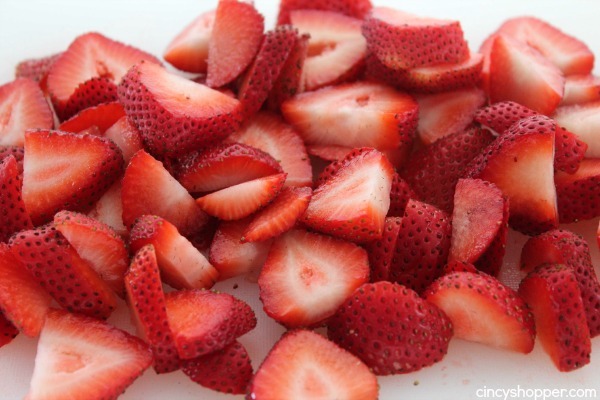 Stir in 16oz box sliced strawberries. Pour into a purchased graham cracker crust…wa la wonderful. 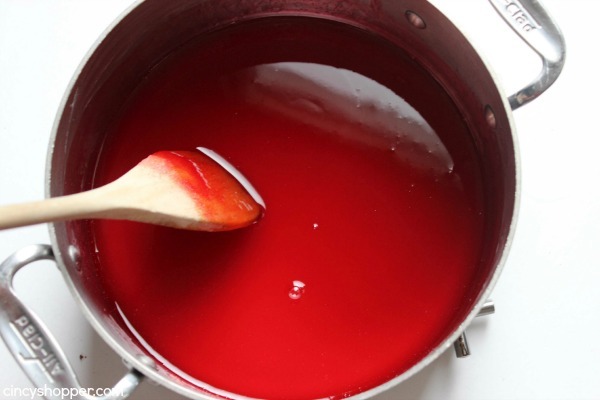 Do you need to let the jello mixture cool before you mix it with the strawberries? I didn’t, and it turned out fine. If it cools it will set. Use it hot or warm before setting. Oh this pie looks delicious. This recipe is going on the must try list. Best regards from Trondheim, Norway! I just had to try this recipe I was in the grocery store and they had strawberries on sale and thought about making a strawberry dessert so I brought some and came home and found this recipe on pinterest and man let me tell you it is as good as it looks. How long does it take to set fully ? Mine has been in the fridge for an hour and it’s still not set. 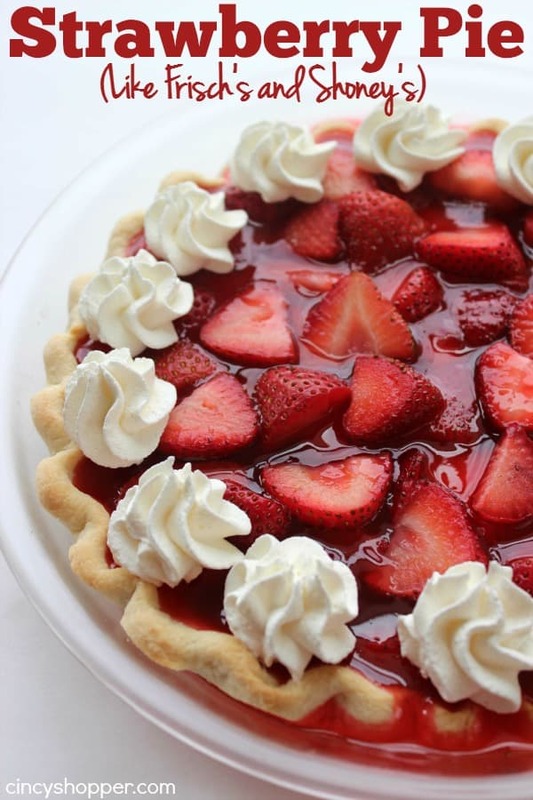 Am dying to make this pie! Do you think it would work using SF strawberry Jell-O and Splenda granular? Mine never thickens. I brought it to a boil. I turned it down to simmer, but it never thickens. So, I never take it off the heat to add the jello. What’s wrong? I’ve made this pie for many years, and suddenly a few years ago I had the same problem with ot not setting up or getting firm. My aunt and I finally figured out that since companies (such as Jell-O) have reduced the contents of their packaging, it is a little less now (3 oz) than what it uaed to be (3.5 I think) So……..I started measuring out the jello to equal the previous amount. Or when I double the recipe, use the bigger box instead, which is 8 oz. Hope this helps everyone. I had the same issue with other recipes, so now I actually pay attention to the measurements a little more than relying on the old “One box” method. ? Did you mix the cornstarch and sugar together well and then add the cool water? It sounds like the starch didn’t get mixed in well so couldn’t thicken the whole batch. It should start to boil and then turn from opaque to translucent as it cooks. You have to let the jello mixture cool before pouring it overnight the strawberries. It was a lesson I learned last year after making it twice without it setting up. I just cut this gorgeous strawberry pie and it does not disappoint. It was so easy and definitely reminds me of the one served at Shoney’s but I believe it is tastier. As a matter of fact, I am having pie for supper tonight! (I am 60 years old so I certainly can, right?) Thank you for posting this recipe…my children and grandchildren will love it. Making this right now for Father’s Day dessert!! Can’t wait to try it!! So far is looking good! OH EM GEEE!! The Pie was freaking AMAZING!! This is a very good recipe! Love it!! Too sweet. Needs more berries, cut sugar to 3/4 c and water to 1c. Add a little lemon juice or zest. Use 1/2 of a small box of jello. Gives it good coloring & flavors the sauce. This is the way my Mom made it (using her own killer pie crust) and was always being told that it tasted JUST LIKE Frisches if not better! 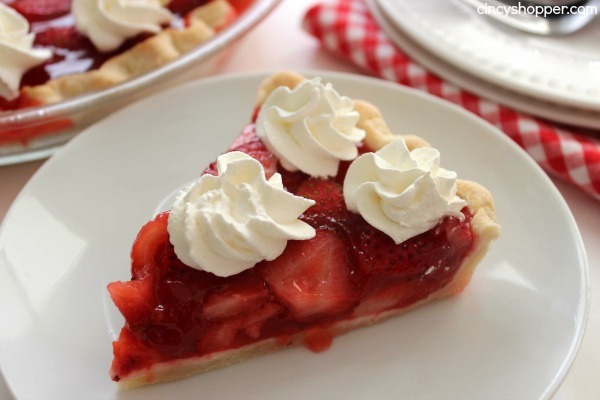 This is the best strawberry pie. You brought back good memories. I would also recommend less sugar. This came out really well, though. I used just a 1/4 cup of sugar because we have cut way back on sugars and it’s just as good. I grew up in Tennessee and inhaled Shoney’s strawberry pie. It’s been years since I’ve had it. Thanks for the recipe. I totally need this recipe! Love those pis from yesteryear! Pinned Thanks for linking up at #MerryMonday! My kids will love this. Thanks for the great recipe idea! Pinned it! I make a pie similar to this and I “paint” the bottom crust with melted chocolate chips, let them harden then add the berries. Adds a little extra something and the crust doesn’t get soggy. After it sets (pie) can I leave it out on the dessert table? Weather not to hot yet here! Thank You in advance! It has been two hours and it has not set up yet. I followed the directions to a “T’. Does it take longer to set?? I couldn’t resist and took a bite of it. I am determined to eat it even if it does not set! Tastes good. This has got to be one of the easiest pies I have ever made and very delicious m!ight I add!!! Recipe is definitely a keeper!! This is my 5th time making this pie in 3 months! Wherever I bring it, people love it! Recipe is so simple! Can’t wait to make it when strawberries are in season ????! This looks so delicious. Perfect for a summer picnic. Thanks for sharing this with us at the Waste Not Wednesday link party. Can’t wait to see what you’re up to this week. I found this recipe on Pinterest while looking for ways to use all of these strawberries from my garden. I just made it and my family loved it! I think I would still like it with a little less sugar so I will try that next time, gotta watch the wasteline! ;) Thanks for the easy recipe!